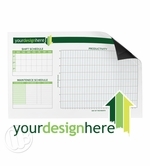 Simply the best custom printed whiteboards available. 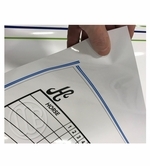 Our printed whiteboards, magnets and vinyls have a very smooth, glossy dry erase writing surface that doesn't ghost when it's erased. 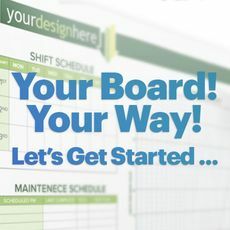 There are very few design limitations and we can print boards up to 12' long. We can print black and white or full color images for the same low price regardless of how many colors you need in your design and we make the design process quick and easy. 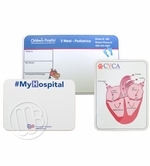 - For Health Care Facilities - you can clean surface with Isopropyl alcohol - It won't damage the writing surface at all. - Quick turn around time! - Usually less than a week once art work is approved! 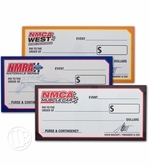 Magnetic - Use with Magnets or Magnetic Accessories. 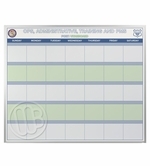 Extra Tall Custom Printed Magnetic Dry Erase Boards. 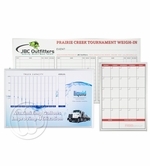 Custom printed lap boards Single or Double Sided. 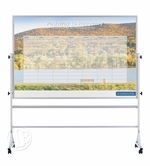 Portable Magnetic Whiteboards with Print on One Side or on Two Sides. 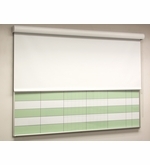 Pull-down privacy and projection screen. Keep sensitive information private!